He receive 4 certificates or awards and a cheque. Read the details at the success story post. 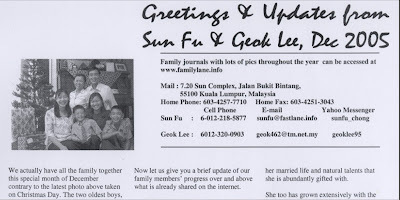 For his past achievements up to the current date, Dad felt he deserved to have his own profile webpage created here. Our family tradition is to have a tea ceremony on the 15th day of the Chinese New Year to have each child kneel before the parents to give a verbal wish to the mother and father individually. Following each verbal wish, the child would serve a drink(herbal tea, orange etc) in which he would get a red packet or 'ang pow' containing money from his parents. This year, because Dad came too late from KL on the 15th night and some of the boys had slept, it was done on the next day but still considered on the 15th day, according to American time! Dad lives on with his motto, "Better Late than Never!" The oldest present, in this case Han, prepared the drinks and was the first to give his wishes. Mom receives the cup of drink after hearing her wish from Ern. Last is Ray to give his wishes. Oh... Mom gets to give a wish to Dad too and receive an 'Ang Pow' as well! Post dated comment : I discovered in Feb 2011 while finishing the Chinese New Year blog that referred to this post to discover that the link to a video of the last lecture above did not work any more. A new link that works is now found here here . Coincidentally I had started off the year 2011 with a post on the 'Last Lecture' by Professor Randy Pausch. An overwhelming feeling came to me that I had picked up the video in Feb 2008 when Randy was still alive but forgot about it until 2011 to feature him in the January post as I had just finished reading his book. Randy had passed away on July 25th, 2008. The New Year kicked off with major events of a Death, Marriage and a Birthday in January. The forthcoming photos and stories will be about how we celebrate the ushering of the Chinese New Year which is the Year of the Rat. Our Greetings are found in our webpage here and so let's celebrate together! Keeping the kids happy with cartoons on a 4 hour journey that turned to 6! Our adventure will cover KL, Ipoh, Penang and back to Singapore again to visit relatives and friends throughout the journey! While in KL, the boys got to feast themselves with their favorite Indian 'Roti Canai' meal and just as well as all the other Chinese food stalls are closed anyway. Soon we are on the road again and with the familiar limestone hills in the horizon, we know we are reaching Ipoh. Memories of my mission days in Ipoh flow to my mind as I see those hills. They are recorded at the post here. We were on the road again and when we reached Penang at the toll gate to the Penang Bridge to cross to the island, there was a massive traffic jam. First stop was to visit my old missionary companion, David Soon in his home in Tanjong Bungah. Memories of our first meeting together is recorded at the post here. Of course there was fun at the games room too! With some cheating at the pool table. With my oldest sister in her home discussing family history. Our family pedigree chart is posted here. From left to right : Hui Chieh and Hui Xing (children of her 2nd son and wife - Chong Beng & Ai Lin) Hui Xing or Jessie Lim is a November baby born on the 18th as our Ray is on 2nd and Shuan 8th of November. We said goodbye to my sister at the front entrance of her home, decorated for the Chinese New Year. We promised to be back later in the year on 6th Sep to celebrate her 70th birthday! 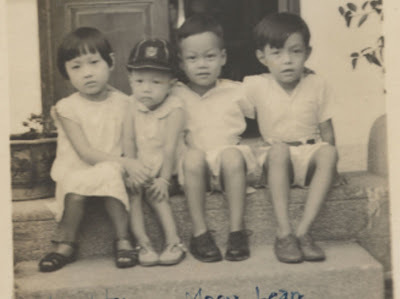 Here is my sister seen on the far left of an old photo taken on the same entrance of the house in Lorong Seratus Tahun in Penang. She was living then with our grand mother, Cheah Suan Kee. On her right is Sun Yeh, Sin Whye and Sun Yit. Find them all in their relative positions under our family pedigree chart posted here. A trip to Penang island is not complete without savoring its local food and that was exactly what we did before starting our journey back. Instead of using the bridge, we decided to enjoy a ferry ride across to the mainland. It was a long drive back south and Han clocked over an hour's worth of driving experience on the highway under his father's supervision. We broke journey in KL to give us a chance to give Simba a hug. We made it safely finally to Singapore on Sunday night. The traffic to Singapore was reasonable but we were happy that we were not on the other side where from the photo you can see the continuous string of white lights of cars returning to KL.